Patty's Utopia: The Latin Nightlife Keeps Growing And With It, The Number of Latin Bands! The Latin Nightlife Keeps Growing And With It, The Number of Latin Bands! I always try to support my fellow artists in Seattle as much as possible, especially when they are musicians and even more when is Latin music. I recently was invited to the presentation of a new Latin band in the Seattle area named “Buena Vibra” (Good Vibe). The band leader, Steve Guasch, is a well known musician in the Latin music scenario and the owner of the first Latin record label in the Pacific northwest called "Salsaneo Records." Their sound is fresh due to the use of a vibraphone instead of the typical brasses. I had played with the pianist and bass player before so I knew how they sound, but I still needed to hear the rest of the musicians and that made me pay extra attention. The singer/conga player sang original pregones (verses), which is to me a must when singing salsa music, since that's pretty much what makes a good sonero (improviser), apart from singing in tune of course. The timbal player kept the beat and the percussion section well together, very important when playing Latin music. The vibraphone player had a nice sound and his improvisations were filled with nice melodies. My big surprise was when Steve Guasch dedicated one of my favorite salsa songs of all times to me, "Todos Vuelven" (Everybody Comes Back), lyrics by Cesar Miró and music arrangement by Rubén Blades. It’s important to mention that Rubén’s arrangements are known for their complexity. At the end, I was very pleased to hear how well they performed it and to feel the good vibe that their name proclaims. As a musician, all I have left to say is, “Buena Vibra” is a Latin band that I encourage you to support! 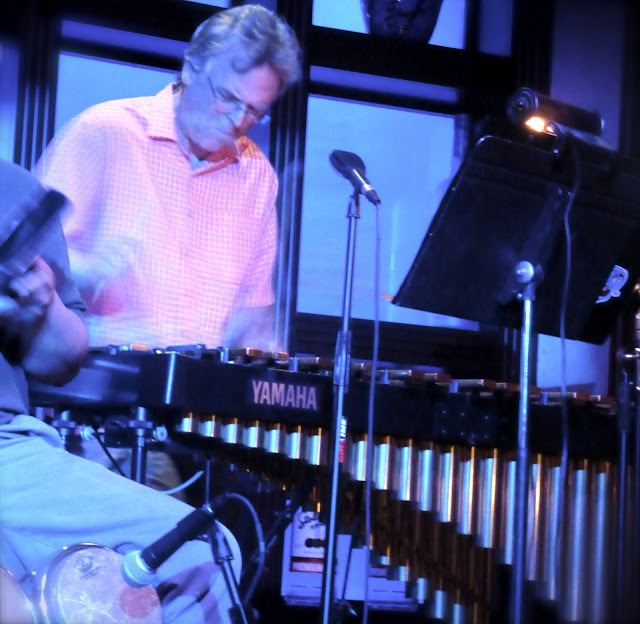 From left to right: Fred Hoadley (pianist), Joe de Jesus (singer/congas), Steve Guasch (bongos/campana), Scott Ketron (vibraphone). On the back: Jeff Norwood (bass), Samuel Alamillo (Timbal). Patty's utopia has been created to share my passion for Latin music, the Latin food, and places I'd like to visit while adding a different perspective. Can My Business Help My Community? You Bet! Devious Maids, East Los High... More of The Same? The Night Supreme Court Justice Sotomayor Spoke to My Granddaughter. If You Thought That Being a Salsa DJ is Easy, Think Again. Copyright © 2012, Patty's Utopia All Rights Reserved. Picture Window theme. Powered by Blogger.